Welcome to the brand new Orkney Islander magazine website, where you can find a wealth of information about the magnificent Orkney Islands. The launch of this website in 2017 marked a significant milestone for our magazine, celebrating 30 editions. 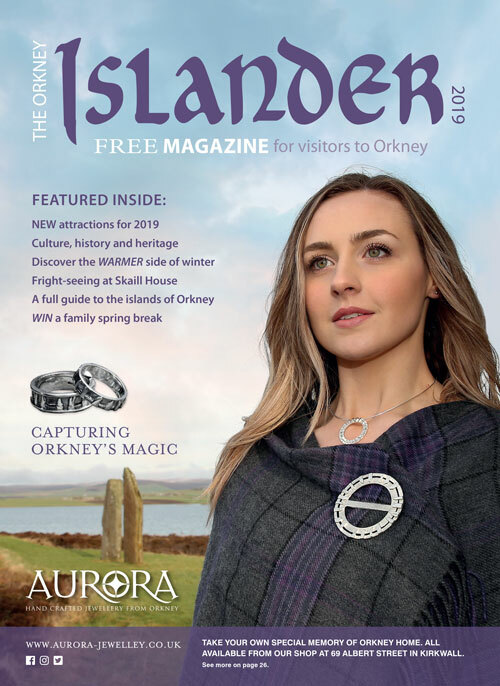 The Islander magazine is a product of The Orcadian Ltd — producers of Orkney’s long established local newspaper — and aims to provide visitors to the islands with a unique perception on Orkney, from the inside out. As such, in our magazine, you will find articles written by locals in the know, on everything from industry to arts, food and drink to archaeology, history, culture and entertainment. What makes us unique? Our contributors hail from all corners of the islands, and are simply full of local knowledge. Check with us for tips on where to go, what to see, and who to contact. What you will discover on the pages here is just the very beginning . . . we have big plans! While you are here, take a moment to explore, and make sure you enter our competition to win a family break to Orkney — it’s a great prize, and we’d love you to be in with a chance of winning! Win a family spring break in Orkney! Orkney’s distinctive and remarkably varied range of food and drink truly encapsulates the essence of the islands. The county’s many delicacies are now stocked on supermarket shelves and served in restaurants across the UK and far beyond. Find key producers, restaurants, cafes and more here. Searching for cutting-edge concepts and quality garments, inspired by and made in Orkney? Check out this page, where you can find a list of Orkney designers and boutique shops. With a range of some 30 festivals and events taking place each year, Orkney offers something for everyone in all seasons. Check out our diary of events here. Orkney is positively teeming with makers and artists. From world-recognised jewellers to textiles, pottery and carpentry, the islands are renowned for producing inspired, beautiful products. Recently dubbed the "source of Britain's first common culture", Orkney is an absolute treasure trove of archaeological sites, historical relics and cultural charms. Check out some of the key sites and places of interest here. Orkney's employment rates are among the highest in Scotland, with fishing, farming and renewable energy leading the way in this thriving island community. You will be spoilt for choice when it comes to finding the perfect accommodation in Orkney. From luxury self-catering with a hot tub, to camping with home comforts in a yurt — the islands will cater for your every need, with something to suit all budgets. You can find information on various parish churches in Orkney. Recently named the UK's most romantic destination by publishers, Mills and Boon, it is easy to see why Orkney is a dream date for couples from far and wide. Planning a wedding? Look no further . . .
Orkney has a thriving sporting community. Both local and visiting sports enthusiasts enjoy what is widely recognised as a unique setting for many pursuits, outdoor and indoor. Check out our interactive islands map, where you can visit the individual islands of Orkney to learn more.